From the beginning, Jim Thompson knew he was going to catch hell no matter what he did. And during a childhood spent at the mercy of a father whose schemes put him on the wrong side of the law as often as the right, and a grandfather who knew the bad parts of town like the back of his hand, young Jim learned sin better than any writer had before. 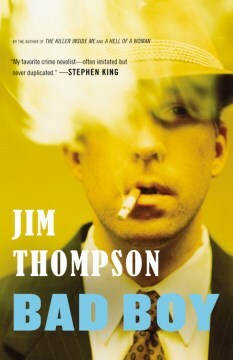 From his rabble-rousing adolescence in the American Midwest, to wasted teenage years in the seedy underbelly of the hotel industry, to Thompson’s chilling encounter with the real-life inspiration of THE KILLER INSIDE ME, BAD BOY offers a fascinating glimpse at the formative years of the man who would become one of the most famous authors of modern American Noir, in the autobiography-as-novel that follows the birth of the legend himself in the signature style Thompson made famous.